The wonderful Ginny of Fishcreek Studio invited me to join along in the Around the World Blog Hop. During this hop, bloggers are sharing what they are working on and about their creative processes, what fuels their creativity, why they create or just about how they create. What's awesome is that you can go check out what Ginny had to say about her creative process and you will be able to go check out two of my quilty friends and what they have to share next week. First I will talk about what I'm working on. The past few weeks I have been wrapping up a couple of Instagram swap projects. I made this mini for the IG Mini Swap. My partner was the amazingly talented John Adams. He requested something outdoorsy and woodland like. As a swapper, you always want to make something that your partner would like but this was a tall order for me. I definitely felt a little intimidated, but I put forth my best effort and hopefully I didn't disappoint. The other swap that I'm trying to finish up is the Schnitzel and Boo Mini Quilt Swap. My partner has a wide range to her style but I think I might be going in the right direction. 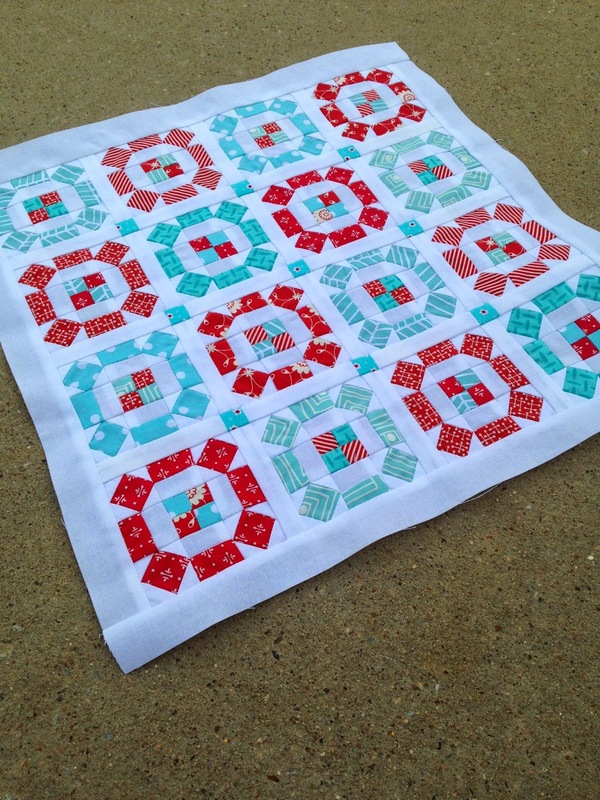 I'm planning on some basic straight line quilting for this mini so that it doesn't take away from the pattern. By the way, those are 3" blocks!!! I haven't tried piecing anything that tiny before so I was pretty happy when I saw the corners matching up pretty well. 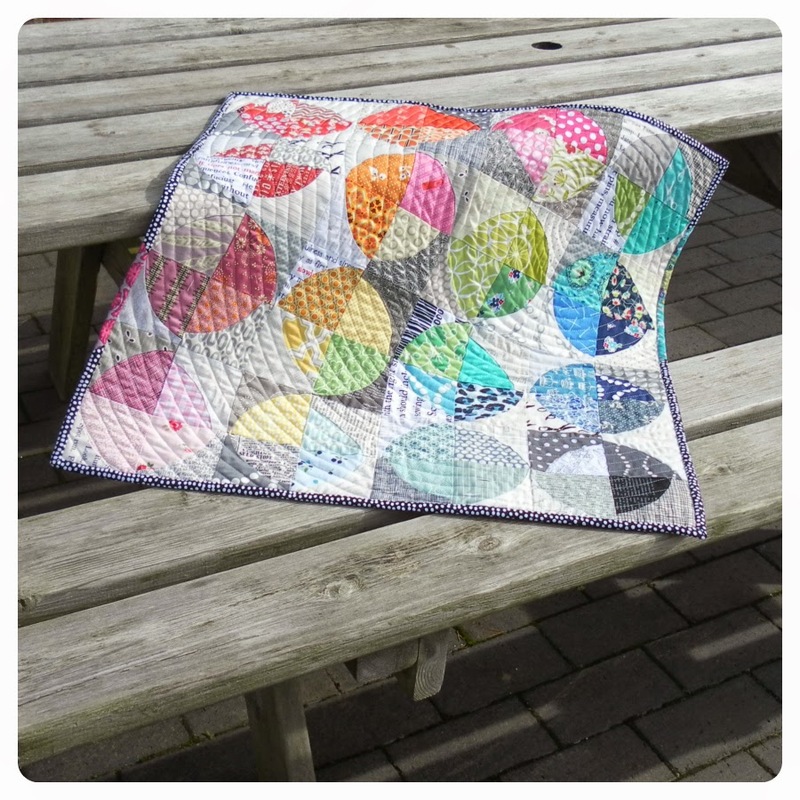 Showing what I'm currently working on is the easy part of this blog hop. The difficult part for me is describing my "style". I don't know about you but I feel like my style is always changing and evolving. When I take a moment and look back at quilts that I made when I started quilting 4 years ago, I can honestly say that I would never make those same choices now. I'm not saying they were "bad" choices but they just wouldn't be choices that reflect who I am creatively at this moment. As of right now, I would have to say that my style would be "thrifty scrappy". I'm not really sure that's a real thing but after just having a little one my fabric budget has disappeared. Did you know that kids are expensive? Friends always joked with my husband and I about that when we were expecting but it's a real thing!!! Consequently, I have grown to love taking odd shaped pieces of fabric that others might see as useless and making it into something beautiful. I love getting the most that I can out of a yard of fabric! My steampunk quilt, which is pictured below, is a perfect example of this. All of the fabrics used to make this quilt, except for the sashing and inset triangles came from scraps!! These are scraps most people would have tossed after a project. I will admit that it took forever to cut everything out for this quilt because it didn't come from pretty yardage but my goodness look what could have been "tossed out in the trash". Ever since this quilt, I have had a new appreciation for scraps. I have a feeling I will be digging through my scrap bins and sewing through my stash for several upcoming projects in 2015. As quilters we all have different reasons why we create, but it all boils down to the same core belief. Being creative is simply who we are. It's what makes us tick, it's what fuels us to keep stretching our minds, it's what brings us pure joy, and for some of us it's how we give back and show love to others. And that my friends is why I quilt. It's simply who I am. If you search through my blog you will see my evolution over the past few years. Who knows who I will be at the end of 2015, but I am excited about what another year holds for me in my "creative world'. Now to introduce you to two very talented blogging friends of mine. Hadley from Flying Blind On A Rocket Cycle. Who makes some of the most gorgeous projects ever! And Julie from Jolie Maxtin, who I have had the pleasure of hosting swaps with. She is such a sweet and amazing person. I know if you go check her out you will adore her as much as I do. Have seen the "Around the World Blog Hop" posts that have been circulating throughout the blogging community the past few months? This blog hop is a great way to learn a little bit about bloggers that you follow as well as find new quilting friends to follow! Ginny from Fishcreek Studio invited me to play along. If you hop on over to Ginny's blog, you can see the ladies that she has featured today. Since I am one of them, you will get to meet a quilty friend of mine next week! A co-worker of mine, Katie, found out that her cancer had returned last summer. The doctors found 7 tumors in her liver that they said were inoperable. Her only option was to do an intense round of chemotherapy. The chemo has been rough on Katie, although you would never know it from her demeanor. On my way home from work one day, the Lord really laid her on my heart. And at that point I knew I was supposed to make her a quilt. So I searched for the perfect pattern and fabric that would brighten her day when she looked at it. 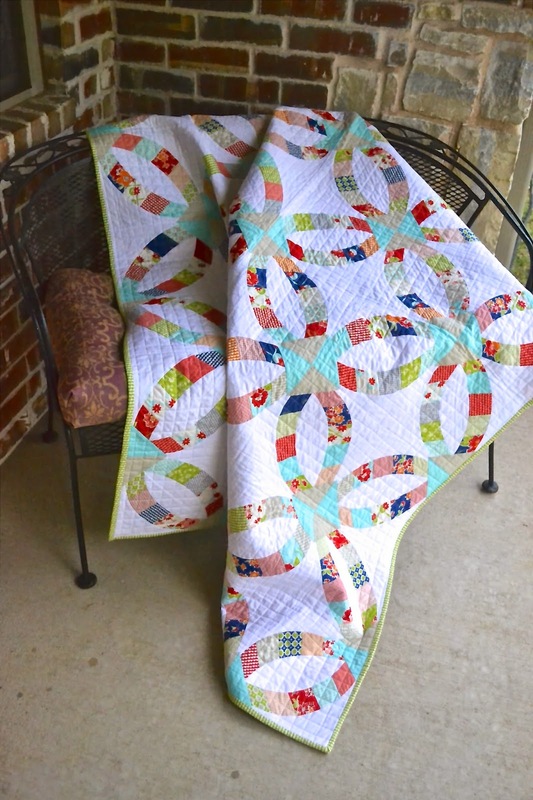 I used Miss Kate by Bonnie and Camille for the fabric, and Metro Rings for the pattern. Although I can't personally make Katie healthy again, I really hope this quilt will bring her some comfort and peace. Watching Katie go through this journey has been one of the most amazing things for me. And I know that sounds odd but she has endured with so much class and positivity. Daily, she speaks of how blessed she is and talks about her plans for the future. She walks around with a smile on her face despite how she might be feeling inside. She has shown strength that I could only wish to possess. She has put life in perspective for me lately. At times, we all have the tendency to get frustrated by our small problems not even thinking about how it could be worse. So I wanted to try to make something as beautiful as Katie and her sweet spirit. Due to Katie's inspiration, my goal for 2015 is to be thankful! Instead of getting wrapped up in the small and trivial dilemmas that might come my way, I pledge to be thankful instead. I am blessed to have a beautiful and healthy family and all of my needs are met so really what do I have to complain about? If you read this, Katie, thank you for being an inspiration. You are creating a testimony through your daily walk. Be blessed my friend.